Here is a short article that may be of interest to those researching the Cochran or Harrison families. 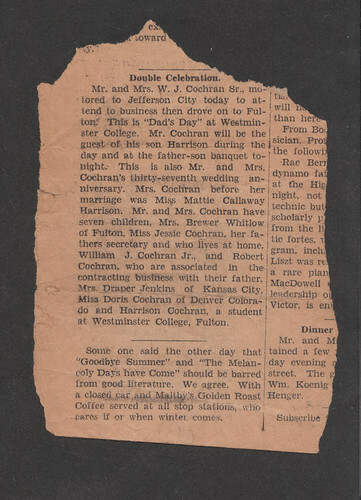 It was printed in 1927 and references the marriage of Mattie Callaway Harrison to W.J. Cochran in 1890. Although the Cochran family is well documented (due to W.J.’s successful construction business in Boonville, Missouri) it’s alway nice to have extra evidence.